Strong historical ties exist between Celtic folk music and the traditional arm of music that emanates from the americana movement flourishing in North America. These ties are further strengthened with the annual collaboration between Scottish fiddle player Aly Bain and American dobra maestro Jerry Douglas, which over the last couple of years has taken to the road under the banner of the Transatlantic Sessions Tour. This clever concept of fusing the talent of top quality vocalists and instrumentalists from both sides of the pond has proven to be extremely successful in the studio and is now carving its own niche as a live project. 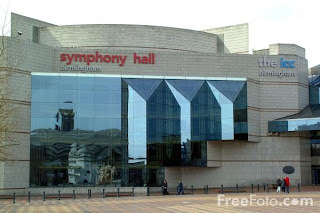 This return visit to the delightful Birmingham Symphony Hall was extremely well supported and received, although Jerry Douglas was on familiar territory following last November’s successful show at the same venue with Alison Krauss and Union Station. Although it’s a joint venture, Douglas comes across as the focal point of the evening where several accomplished artists perform on an almost synchronised rota basis, ably assisted by the orchestral sound of twelve traditional musicians. The value for money- nearly three hour show is neatly packaged into two contrasting halves which create a perfect opportunity for both instrumentalists and vocalists to display their talents. Tim O’Brien, Ruth Moody and Raul Malo delightfully represented our American and Canadian cousins with their diverse vocal skills in a first half that was designed to primarily showcase the vocalists. O’Brien opened the show with his own brand of West Virginian mountain music and also closed the first half with a rendition of Woody Guthrie’s folk anthem ‘This Land is Your Land’. Moody, fresh from touring solo without the Wailin’ Jennys for the first time, chose an opportune moment to further promote her superb album ‘The Garden’. Malo needed little introduction to the audience, who may shortly get another chance to see him in the upcoming reunion of the hugely successful Mavericks. The first half also hosted performances by two outstanding vocalists from the world of Scottish folk music, Eddie Reader and Karen Mattheson, with the latter’s version of ‘Aragon Mill’,probably the highlight of the opening set. Reader also sang a duet ‘Love is the Way’ with the final vocalist on show tonight, the up and coming Irish singer Declan O’Rourke. Amongst all these wonderful songs were a couple of fiddle tunes that served as a prelude of what we were going to expect in the second half of the show. After the interval, select musicians from the twelve piece strong ensemble came more to the fore as the vocalists each returned this time for only one individual song. Douglas led the way with a highly skilled demonstration of the dobra with further spotlight on his fellow American string musicians, Bruce Molsky and Russ Barenberg. Molsky, a great exponent of Bluegrass music, also displayed his vocal skills on the number he performed while Barrenberg, a long time collaborator with Douglas, was equally impressive with a guitar instrumental. The assorted home grown musicians led by Aly Bain were at least the equal of their transatlantic counterparts. Mike McGoldrick stunned the audience with a haunting pipe solo while the fiddle playing of John McCusker would enhance the sound of any traditional band on either sound of the Atlantic. The faultless show was brought to a close with an acknowledgement that the Sessions had yet to pay tribute to a Hank Williams song on stage, so Raul Malo remedied that with a version of ‘Hey Good Lookin’ enthusiastically accompanied by all the guests of Douglas and Bain. The next stage of this project is a continuation of the thirty minute TV programmes due to be aired on BBC4, although few would bet against it hitting the road again sometime in the future.